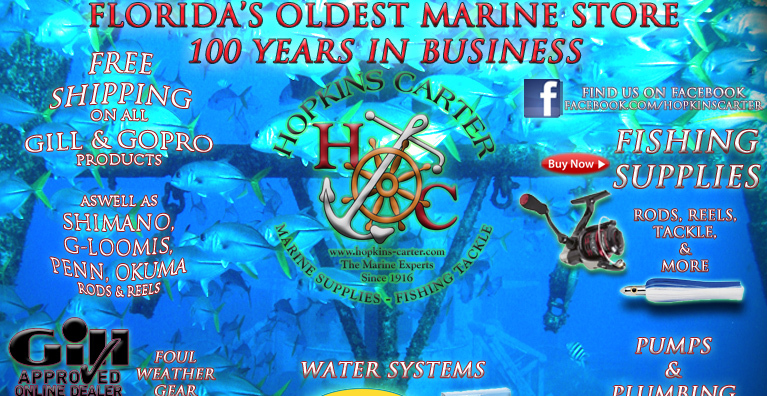 Hopkins-Carter is a full service marine supply and fishing tackle store. We have been located in South Florida since 1916 and are dedicated to providing the best service possible. Hopkins-Carter Marine has been serving yachtsmen and fishermen since 1916 with a superior array of boating and fishing products. We pride ourselves in supplying our customers with only the highest quality product lines and the most highly skilled and experienced staff, many of whom are specialists in a variety of marine disciplines. This tradition of honest value for our customers and a true love of the sport equates to a company not only proud to serve our seafaring peers, but proud to share the family tradition. We also offer fishing rod and reel repair. Our product line includes premiere vendors and manufactures like ITT Jabsco, 3M, Perko, Gill, Alutecnos, Rule Industries, Boatlife, Aftco, Shimano, Penn, Okuma, Interlux, Awlgrip, Lenco, Sea-Dog, Suncor, Lewmar, Ocean LED, Lumitec, Blue Sea, ACR Electronic, Garmin, Grundens, Mustad, Gamakatsu, Shurhold, Taylor Made, Samson Rope, Acco Chain, Garelick to name few. Monday - Friday: 8am to 6pm. We will make every effort to ship your order within two business days of receipt of that order. In the event we are unable to ship within that time period we will notify you of the expected shipping date and give you a chance to cancel the order if the shipping date is not acceptable. To our current and future customers: We apologize for any inconvenience this may cause, but we can not ship UPS to a P.O.Box number. It is against UPS Policy. If you place an order with a P.O Box we have to ship US Postal Service which means no tracking number and no guaranteed arrival time. Our preferred method of shipping is UPS. So if you order a product like fans and you give us a P.O. Box # we will contact you and ask for an address we can ship UPS to. If after several attempts via email that you provide to us with no response we are forced to ship US Postal Service & if it does not arrive we have to wait to hear back from you.